Pope Francis: What If It Is Just A Matter Of Language? It was Cardinal Gerhard Ludwig Mueller, Prefect of the Congregation for the Doctrine of the Faith, who gave a wider breadth to the current debate around the Vatican and within the Church. The debate involves Catholic doctrine, the post-synodal exhortation “Amoris Laetitia,” and the Pope himself, and it has taken very sharp, almost wary tones, culminating in a division between “pro-Francis” and “contra-Francis” parties and at the charge that Pope Francis is allegedly disturbing big corporations and even wealthy individuals, all this according to a manner of thinking that seems to come directly from the 70’s. Cardinal Mueller did not get into the hot-button issues. He did not say which is the right interpretation of “Amoris Laetitia” or of the Pope’s words on various occasions. Nor did he try to normalize the situation. He simply put things in the right order, following the principle that matters must be observed from their historical perspective. History is perhaps the biggest topic absent from the debate. Let us proceed in an orderly fashion. On December 12, Cardinal Mueller delivered a keynote address at the presentation of the seventh volume in the Italian series of Joseph Ratzinger’s “Opera Omnia” which the Cardinal is editing. The volume collects writings and speeches by Joseph Ratzinger on the Second Vatican Council. In fact, what we are experiencing today is the last part of a long debate about the Second Vatican Council. This debate started during the Council and polarized the Catholic Church (the distinction between conservatives and progressives is one of its inheritances). Under St. John Paul II and Pope Benedict XVI, this polarization was apparently overcome. Now, matters have returned to the past. Pope Benedict XVI clearly explained that the Second Vatican Council could be understood only through the lens of continuity, and his important legacy lay in the notions he developed in relation to that event of the “Media Council” and the “Real Council.” Now, formulas like “the Spirit of the Council” are in fashion once again, a Third Vatican Council under Pope Francis’s guidance is hoped for, the possibility of a new synodal season on the basis of what Pope Francis openly says is more and more the subject of rumors. Probably, that is the core issue: the Church and the faith are described with secular words, and everything in the Church today is discussed in a secular manner. This is how the Church comes to be viewed as an NGO, which Pope Francis says he wants to avoid. Cardinal Mueller’s words thus provide a new interpretative key to the ongoing debate. The four Cardinals who submitted to Pope Francis their five “dubia” about “Amoris Laetitia” are continuing in this vein, and they have now also noted that Canon Law foresees the possibility of a formal correction of the Pope. But from the other side, these words are interpreted as an attempt to discredit a Pope who is “not appreciated” by Western business and financial corporations, a charge which conforms to the “Francis-against-all” plot outlined in many books and even in a journalistic investigation that listed the first and last names of bloggers and journalists who are allegedly against the Pope. 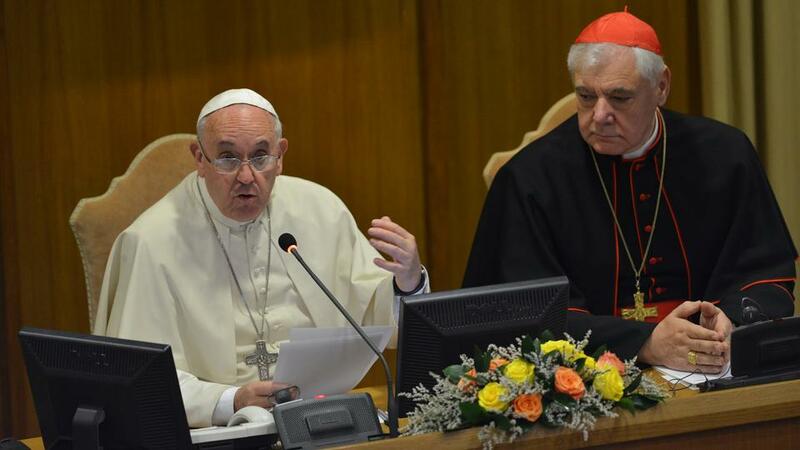 The next thing to happen was that debate over “Amoris Laetitia” focused on the issue of the Synods’ consensus, based on Pope Francis’s own words. In an interview granted to the Belgian magazine “Tertio,” the Pope said that everything written in “Amoris Laetitia” received a consensus of two-thirds of the bishops who took part in the Synods. But this is not so, and this fact can be verified by glancing at the vote tallies on the propositions contained in each of the Synod’s final reports. 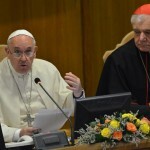 Pope Francis wanted the votes on these propositions to be made public, because he wanted even those propositions that did not achieve the Synods’ two-thirds majority consensus to be included in the final document. But the principle of communion is lost when the debate is conducted in secular terms. And many of the current debates in the Church are being conducted from a secular basis, no matter which party is involved. It is a secular point, for example, to note that defenders of doctrine mostly come from the wealthy Western world, and that they do not take into consideration the needs stemming from the messy lives of the poorest and most marginalized on earth. It is a secular point to observe that there are ideals in Church teaching that are out of reach for many, and that Church law must conform to peoples’ mistaken judgments and behaviors. It is a secular point to talk about the Church’s teaching in terms of inclusivity, and not in terms of the Gospel. One might object that diplomacy and social work are secular, too, and that the Church has always been at the frontlines for both. But the Church is called to be “in the world,” not “of the world.” It is part of structures, works for the common good, takes part in meetings within the secular world. It’s the mentality that should not be secular. The debate in the Church today is indeed completely transposed to the political side. The Pope is praised when he takes strong stances on economic issues, but there are no praises when he speaks out against some hot topics. From this political point of view, the Church is asked to be more present in the world, while at the same time a sort of democracy is promoted inside the Church, as if everything should change, and nothing, including doctrine, is forever. There are many forces involved in the debate, and they are accustomed to using secular terms. These forces also exist within the Catholic Church. It is an old defect that could be described as “lay clericalism.” A priest, a bishop, is considered – and he considers himself – to be an authority in his field, and he must be treated as an authority. But the fact that he exercises a ministry is completely lost from view. On the other hand, Pope Francis always says that he wants to give the bishops’ ministry more weight, and there are many hints of this intention. From “Evangelii Gaudium” to the motu proprio “Mitis Iudex Dominus Iesus,” Pope Francis has repeatedly indicated his wish to pass more responsibilities on to local bishops, to the point of even devolving some of the competences that should belong to the Roman Curia or to some central body of the Church. Archbishop Charles J. Chaput of Philadelphia correctly interpreted Pope Francis’s wish. He took part in both Synods and implemented their agenda in the guidelines he developed for his diocese. Nevertheless, these guidelines were attacked because they were considered “conservative”, while a similar initiative by the Bishop of San Diego was not attacked. In the end, this debate always betrays the temptation of using two different weights and measures. There is room for local bishops to take on new responsibilities, to implement the Synod’s agenda following Catholic tradition, to work out catechesis in the way they think best. This is what the Pope says he wants. Even in this case, however, it is a matter of language. The Pope is considered almost like a “general” to whom everyone must be obedient, and not as the Vicar of Christ whose episcopal dignity is shared with all the other bishops. The sense of history is lost – consistories, synods, the College of Cardinals have always been the expression of the Pope’s collegial activity. This is the Catholic faith’s big dilemma, trapped between Masonic “secular” propaganda and trends toward Protestantization. The best hope for the upcoming year is probably this: to find a non-secular way to discuss the Church and the Church’s issues.